An on-line platform to provide education, support and empowerment for everyone with different abilities, mental and medical illness, and their caregivers. Over two decades, I navigated for my own son with special needs, advocated for those with different abilities, and successfully fundraised to help directly impact children within our community. To provide education, support and empowerment for everyone with different abilities, mental and medical illness, and their caregivers. Be the change you wish to see in the world. When Tammy Flynn heard this monumental challenge from Mahatma Gandhi, she took it to heart and has been working towards this goal her entire life. As a single parent raising four children, she has sought change by advocating for her children, especially her adult son with special needs. As the owner of Elegance Salon and Spa, she has sought change for the women and girls by empowering them through salon services and workshops for women of all ages that build self-confidence, health and hygiene knowledge. As a philanthropist, volunteer and community leader, she has sought change by helping organizations maximize their missions. Throughout it all, Tammy Flynn pulls her resources to unite people while inspiring them to share their time, talent and energy with the community. Tammy’s newest endeavor pulls from her experience as a serial entrepreneur, philanthropist and her most important role, the mother of a son with special needs. The On-Air Advocate will directly support, empower and educate all those with different abilities, mental and medical illnesses and their caregivers. Her goal is to help bridge the gap in caregiver education and teach caregivers to advocate for their child, adult child or aging parent. Pulling from her vast knowledge navigating the medical and education arenas, Tammy looks forward to providing a variety of educational resources and motivational programs to create a community of caregivers empowered to help their families. Tammy is a self-starter. A life-long entrepreneur, she launched her first direct sales business at the age of 15. She is a licensed beauty professional and holds multiple certifications in the color, image, make up, and fashion industry. She also has certifications in early childhood development, an advanced Certified Nursing Assistant certificate, First Aid and CPR certifications. Tammy is featured in the November 2017 documentary Finding Your Fairytale as Snow White, representing the loving care she provides to caregivers and those with differing abilities as an advocate, caretaker and educator. A long-time volunteer, Tammy has always enjoyed working with children and in healthcare. She has served on the board of Child Abuse Prevention Fund. Along with two other volunteers, she developed a program for the Women’s Domestic Abuse Center to help prepare women for the workforce. Her role provided women with a complete makeover to give them a polished and positive start to new endeavors. She has tirelessly raised more than $500,000 for the Children’s Hospital of Wisconsin and the Make-a-Wish® Foundation. Tammy Flynn’s organizational talents, energy, and resourcefulness have brought recognition from a variety of sources. In May 2010, The Milwaukee Journal Sentinel reported that Flynn pulled off the impossible – raising a substantial amount of money for charity with ZERO administrative costs. In 2011, the State of Wisconsin and Governor Scott Walker declared August 21 to be Tammy Flynn Day. In 2012, she was recognized by radio station 99WMYX as a Remarkable Woman. In 2015, the State of Wisconsin, County of Waukesha, City of New Berlin and Chamber of Commerce awarded her with the John Zino Civic Person of the Year Award. 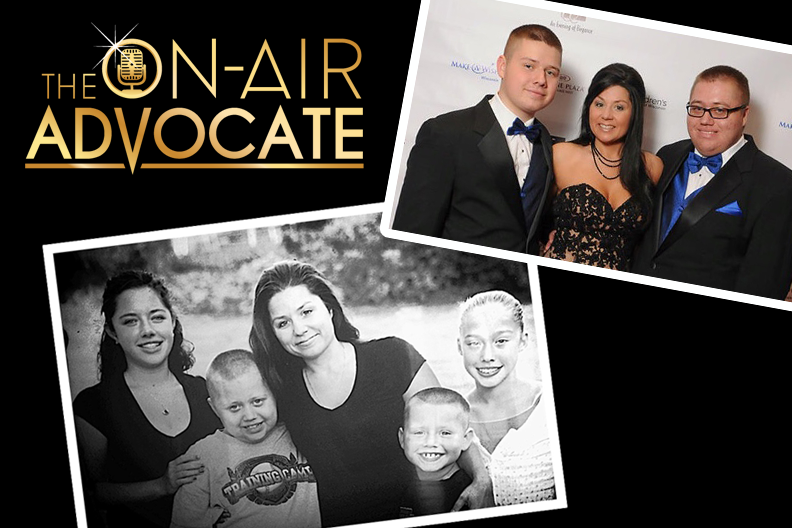 The On-Air Advocate was developed to provide education, support and empowerment for everyone with different abilities, mental and medical illness, and their caregivers. son with special needs. Acknowledging first-hand that there is a gap in auditory information, she launched the On-Air Advocate to provide a variety of education and support that can be accessed 24/7 through the use of a weekly Podcast, videos and the development of an online Facebook community. stories and journeys that will not only educate but inspire. Upcoming topics: Care for the Caregiver, Advocacy 101-Quick Tips, Food Fight, Career to limited life with Graves, Narcolepsy-Project Sleep, and more.